In retrospect, the events Beijing’s central square turned out to be a defining moment in the history of the two nations, the juncture at which Russia and China’s parallel trajectories diverged. We are approaching the 25th anniversary of the tragic events in Tiananmen Square. China has learnt its lessons from them, and other countries pursuing a path of reform would do well to do the same. Primarily, of course, Russia. Firstly, because it is popular to compare the Russian and Chinese experience. Second, because in the late 1980s, both countries found themselves at the same crossroads in history, but each chose its own path. The crackdown on the protesters in Tiananmen Square is no less an important part of China's experience of reforms than its economic component: A balance between market reforms and political stability is the basis of any reform in any country. This is what Russian liberals should remember when they voice admiration for China's economic achievements under Deng Xiaoping. The architect of "the Chinese economic miracle" paid a high price for thus preserving his brainchild: It was he who took the final political decision to suppress the protests in June 1989. Now we understand that in 1989 China made its historical choice in favor of continued market economy reforms and preservation of the one-party system in order to maintain political stability and prevent a breakup of the country. The USSR under Mikhail Gorbachev too made its choice, which was completely the opposite: Attempts to reform the single-party system ended in economic collapse and the breakup of the country. The result is for everyone to see now, although it does not mean that Gorbachev should have followed Deng Xiaoping's example: It is impossible to automatically replicate Chinese experience. 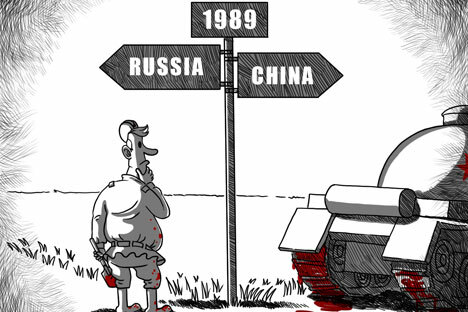 By the late 1980s, Russia's and China's historical paths were surprisingly similar. The theory that Chinese society was focused exclusively on market reforms is not borne out by the facts. At the time, China had its own version of perestroika, which was called "transparency": The Chinese were very much concerned by the side effects of reforms, primarily a dramatic rise in social inequality and corruption, and demanded that the authorities take effective steps to tackle those. It was under these slogans that Beijing students took to Tiananmen Square. Incidentally, the culmination of the events of June 1989 coincided with Mikhail Gorbachev's visit to China. The itinerary for his trip envisaged a visit to the monument to China’s national heroes in Tiananmen Square, however by that time the square had been occupied by protesters. They wanted the leader of "glasnost and perestroika", which they found so inspiring, to address them directly. Gorbachev's advisers were seriously considering that option. One is only left to wonder what Mikhail Gorbachev could have told the protesters on the square. At a senior Communist Party gathering at the time, Deng Xiaoping said: "The problem is not whether the USSR will survive. The problem is whether China will fall next." That was the logic that informed the Chinese leaders' actions. They did not want to sacrifice political stability and the integrity of their country to demands for more rapid political modernization. The Soviet media offered very scant coverage of the events in Beijing, probably because they did not understand the significance of what was happening and were afraid of coming up with "inappropriate" comments during the Soviet leader's visit to China. Also, they were more interested in the consequences of the April 1989 events in Tbilisi, the capital of the Georgian SSR, where special-purpose police units dispersed peaceful demonstrators, who were demanding the very same glasnost and perestroika, with the use of sharpened spades. Later the Russian mass media dutifully repeated their Western colleagues' interpretation of "the Tiananmen massacre". At the same time, Russian correspondents in Beijing (in particular, Vsevolod Ovchinnikov) offered competent and unbiased coverage of the events, leaving us with interesting accounts and memoirs. The consequences of the Tiananmen events shocked the whole country and provoked a deep crisis among the Chinese leadership. The conservative wing in the Communist Party of China used the tragedy to discredit the policy of reforms. Deng Xiaoping put all his power and influence at stake in order to revert that trend. The decision to use military force against the protesters in Tiananmen Square must have been the most difficult of his life, but he is unlikely to have regretted it afterwards. Of course, history does not understand the notion of "what if". A quarter of a century on, we see what has happened to China and what to the USSR. Each country made its choice and any moralizing here would be inappropriate. However, it is important to remember that after the events of June 1989, China began a slow but consistent movement towards democracy, albeit not always visible to an outside observer. The agenda set by the country after the 18th congress of the Communist Party of China includes: developing intraparty democracy and spreading it to the whole political system; combating corruption; implementing the constitutional provisions on a multiparty system in China through encouraging the participation of various public associations in the work of the Chinese People's Political Consultative Conference, particularly at local and provincial levels; gradually reducing indirect censorship in the media, and promoting new electronic media. Vladimir Petrovsky is a PhD in Political Science, an academician with the Academy of Military Sciences, and chief research associate with the Institute of the Far East under the Russian Academy of Sciences.